Although all relationships are clearly different, there are some common issues that cause difficulties in many relationships. By knowing what these problems might be you have more chance of identifying them and solving them or, even better, heading them off before they become a problem. The good news is that although these issues can cause relationship problems, they have been around for years and many couples have worked through them and survived. Jealousy can wreck relationships, leaving one person feeling paranoid and the other as if they’re not trusted. The root of jealousy is often poor self-esteem and this must be tackled. Do all you can to feel good about yourself, whether that’s going to the gym or learning new skills. You must also be open about your insecurities and encourage your partner to be as honest as possible with you. Money can cause some massive rows in relationships, especially if debt is involved. Couples need to be very open about money if they’re going to live together, for example. Not many couples have a joint account these days but you need to ensure that whatever else you spend your money on, you sit down together and budget for bills etc. You can also work out a budget together for saving up for large expenses such as a wedding or holiday. Resentment often comes when people are not open about money so even if you don’t share an account, talk as openly as you can about finances. People now work longer hours than ever and it’s often the case that both partners in a couple work full-time, making it hard to both spend time together and have time alone. Realistically, you may have to schedule time in as a couple. You may say that Friday night is your night and you’ll always spend quality time together then, whatever happens. It’s equally important to make time for your own interests and hobbies. Many time-pressed couples argue about the division of household chores. Resentment builds if one person feels the other isn’t doing enough or one person isn’t doing chores to a high enough standard. Make a rota together and agree to stick to it. If there are some jobs you are particularly adamant are done a certain way, it’s probably best if you take these on yourself and let your partner do a job you’re less picky about. 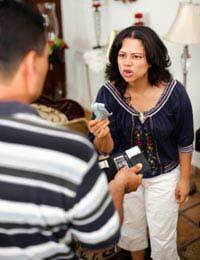 Interfering in-laws and family squabbles can divide couples who have a sense of loyalty on both sides. Couples must try not to take sides in these disputes and where necessary ask family members politely to back off. Your partner should always feel like you’re on their side, whatever happens. Relationships are not always easy and may well throw up these problems and more. The only way to solve problems is to talk about them as a couple and tackle them head on. You shouldn’t feel afraid to bring any problem up in your relationship.